William Smith is my all time favorite B-Movie actor- a truly talented individual whose list of lifelong accomplishments is extraordinary. He single handedly made movies like “The Losers” watchable and even enjoyable if you don’t take them too seriously. 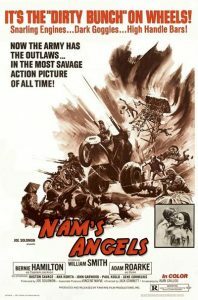 The film centers around the U.S. Army hiring a motorcycle gang to rescue a presidential adviser being held captive in Cambodia. Smith plays gang leader Link Thomas, whose Army Sergeant brother sets up the mission. Most of the movie is spent focusing on events leading up to the mission with the gang partying, smoking, getting in fights and souping up their choppers as the rescue nears. The acting is average, although a respectable cast (Adam Roarke, Paul Koslo & Bernie Hamilton) was assembled. There is too much time spent on love interests which tends to bog down the film, but the latter half especially is very entertaining as the mission takes place. This is 70’s schlock through and through, but is a treat for William Smith fans, as he gets top billing and the lions’ share of screen time. No one will confuse this with anything Oscar worthy, but so what? A good way to numb your mind for an hour and a half.